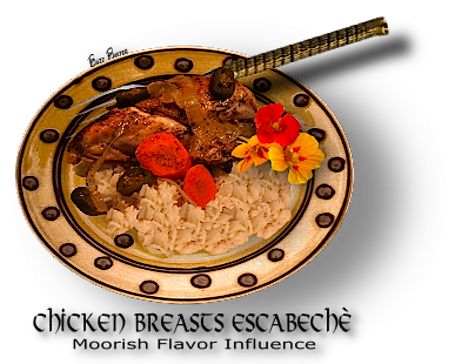 Pickled chicken breasts served cold on rice. This Moorish dish will win you over with it's exotic taste and overtones of a melding of North African and Southern European tastes. Make it the day before and the next day you can serve a meal fit for a King and with very little to do other than enjoy your guests or family. ●  1 cup dry white wine. ●  3 roasted bell peppers, red, green and yellow, cut into 1/4 inch strips. to a platter and pour off all but 1 tablespoon of olive oil. until vegetables are tender. Add the chicken pieces and simmer 3 - 5 minutes.